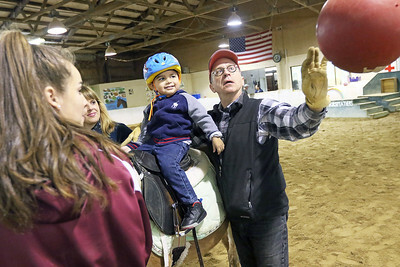 Candace H. Johnson-For Shaw Media Volunteers Anna Shortal, 15, of Lincolnshire, and Allie Roberts watch Angel Cruz, 3, work with Glen Cotton, an occupational therapist, all of Chicago, on hitting a ball at the Horsefeathers Therapeutic Riding center in Lake Forest. 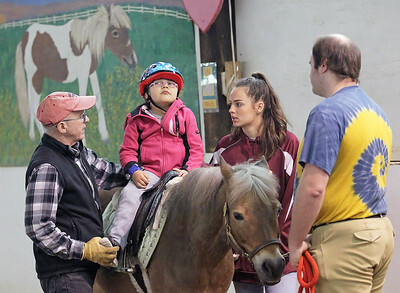 Candace H. Johnson-For Shaw Media Amelia Vaglienty, 6, rides a horse with the help of Glen Cotton, occupational therapist, both of Chicago, Anna Shortal, 15, of Lincolnshire and Evan Kedzierski, of Deerfield, both volunteers, at the Horsefeathers Therapeutic Riding center in Lake Forest. 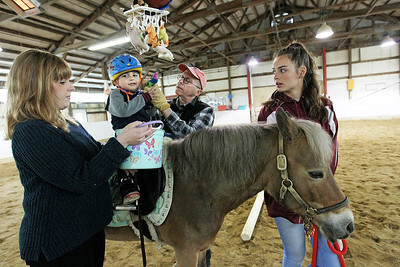 Candace H. Johnson-For Shaw Media Angel Cruz, 3, works with Glen Cotton, occupational therapist, on putting stuffed animals into a bucket as Allie Roberts, all of Chicago, and Anna Shortal, 15, of Lincolnshire, both volunteers, help them at the Horsefeathers Therapeutic Riding center in Lake Forest. 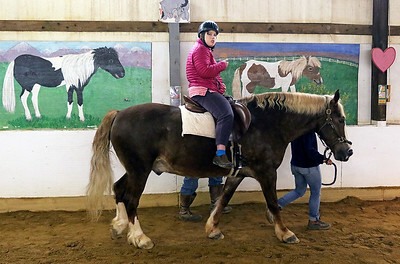 Candace H. Johnson-For Shaw Media Allison Weeden, 18, of Lake Forest gets some help riding a horse in the arena at the Horsefeathers Therapeutic Riding center in Lake Forest. 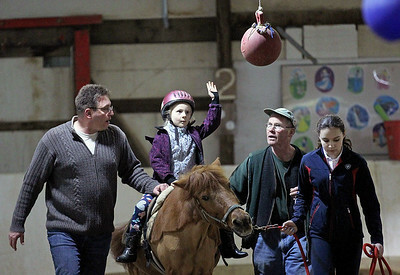 Candace H. Johnson-For Shaw Media Caroline Malinowski, 5, of Chicago hits the ball as she rides a horse with the help of her father, Mark, Nick Coyne, founder and executive director, and Abby Rich, 14, of Lake Forest, a volunteer, at the Horsefeathers Therapeutic Riding center in Lake Forest. 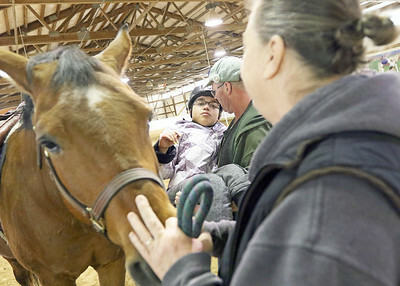 Candace H. Johnson-For Shaw Media Sahara Thompson, 12, of Des Plaines gets off of her horse with the help of Nick Coyne, founder and executive director, and Jyll Knautz, equine therapy instructor, at the Horsefeathers Therapeutic Riding center in Lake Forest. 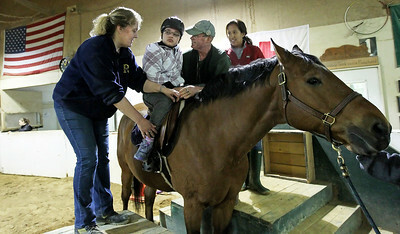 Candace H. Johnson-For Shaw Media Sahara Thompson, 12, of Des Plaines gets on a horse with the help of Lorrie Tinsley, of Lake Villa, Nick Coyne, founder and executive director, and Paula Acuna, of Wilmette, a bilingual speech language pathologist, at the Horsefeathers Therapeutic Riding center in Lake Forest. 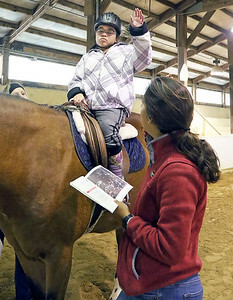 Candace H. Johnson-For Shaw Media Sahara Thompson, 12, of Des Plaines stops riding her horse to work with Paula Acuna, of Wilmette, a bilingual speech language pathologist, as she answers questions regarding the book, "A Picture Book of the U.S.A.," at the Horsefeathers Therapeutic Riding center in Lake Forest.